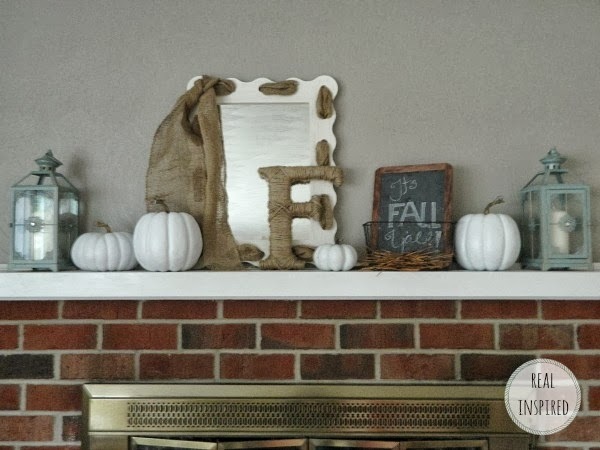 Real Inspired: My First Fall Mantel! 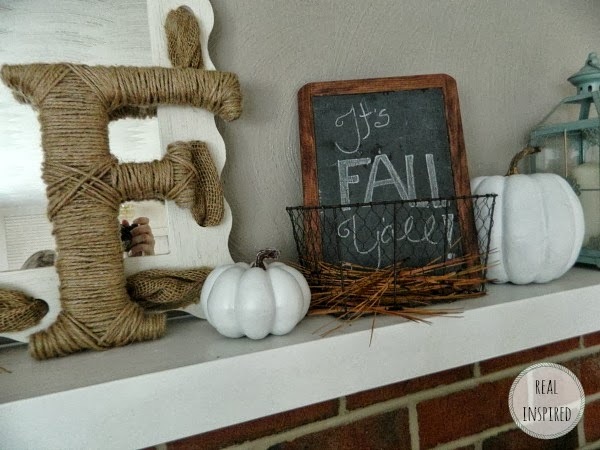 A couple weeks ago, I put together a roundup of some of my favorite fall mantels. Mine wasn't quite done yet. I've sort of had it up for the whole month of September but there were those last little touches that I wanted done. I'm also super indecisive so even deciding what to do was hard for me. But I think I may have finally settled, which is good seeing as it's October already! With my mantel, I was stuck working with what I already had. I did splurge on a few things, but only a few. I've been dying for a mirror over our fireplace but haven't settled on one yet. The one I used I already had and it's a bit small. Our mantel is just so long and narrow, I never know what to do with it. Anyway, the big splurge for my mantel was the pumpkins. I got them at Michael's and used a 40% off one item coupon. I bought 5 pumpkins in various sizes and a few other craft items and only spent a little over $26! So I guess even my splurge wasn't too splurgey. No payment or sponsorship, I just love this paint! But nothing ever seems to go as planned for me. It's usually my fault I know. Like cracking spray paint. That one is totally me. As many times as I remind myself to step back and apply thin coats, I never seem to manage it. So after sanding them A WHOLE HEAPING LOT and after several more coats of paint, my pumpkins are finally ready for their debut. Mostly. There may have been a few spots that I was in too big a rush to get looking perfect. Oh well, if they're up on the mantel, no one will see, right? My fall mantel out started with this. 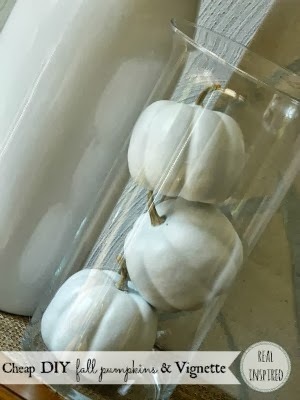 I had been given these orange pumpkins and I tried to use them, but the darker orange just didn't jive with our dark-ish brown-gray walls. I thought of painting those pumpkins, but they are made with something nice and heavy and would probably cost a fair amount of money to buy somewhere. I just decided to keep them orange and pack them up for later. I apologize for my grainy photos. The weather has been bad this week so there is no good lighting to be had. I'll try to get up some better ones when the rain clears. After playing around with it for a while, this is the final arrangement. I wanted lots of natural texture and contrast against the darker walls. The white pumpkins and mirror pop against the dark gray-brown. I love the texture of the burlap and jute wrapped letter. And the pine needles add a bit of nature. Those pine needles were a last minute thing. It has been crazy rainy here the last few days and it's supposed to keep raining the rest of the week. I just reached out the back door today and scooped up a handful of wet needles. I laid them out on a towel and patted them a bit to try and dry them faster. I'm a crazy person. After our yard sale last weekend, we loaded everything up to take to a thrift store. I saved the chalkboard at the last minute. I'm so glad I did! I'm sure I'll get better at this whole mantel thing as time goes on, but for now, I like it. My mantel is just so weird! 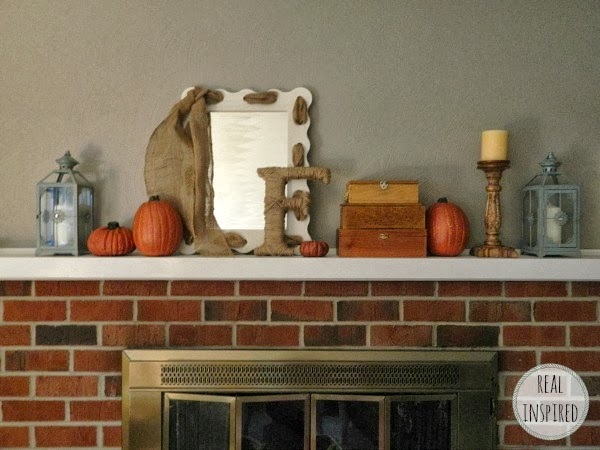 What would you do with a super long, narrow mantel? I don't want to spread stuff all the way across it, but I'm having a hard time getting the correct scale for the fireplace when I just stick to the middle. Thoughts? The decor looks lovely! I have the same narrow mantel issue and am planning on getting a thicker and bit wider board to afix atop of the current one. 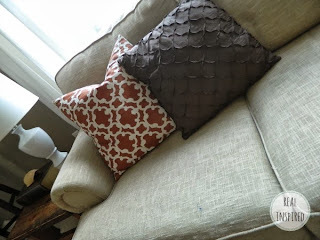 That may add some visual heft and give a bit more space to decorate. Are you keeping the brick color or painting it lighter? I have an odd colored stone on mine and long to paint it. But, I'm a chicken so far! Great effort on your home! Thank you! I hadn't thought of putting another board on top. For now the brick is staying the color it is. 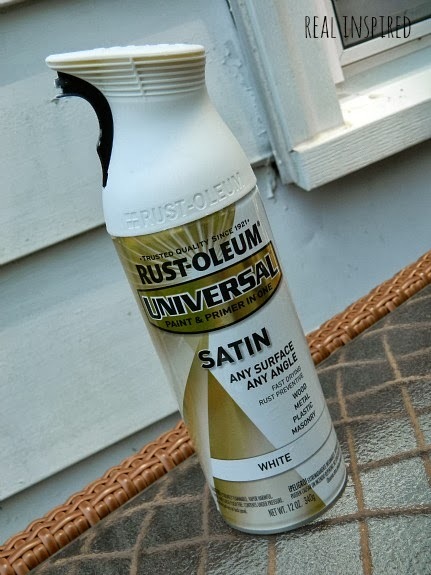 We rent from my in-laws so I can't just paint it. If we're in this house for a while, and once I get all the other rooms taken care of, I may ask them about it. I do love the look of painted brick! Maybe to help the scale due to the narrow depth and long width, hang a longer banner over top of the things on mantel. Or a long picture would help. That would draw the eye up and across. Maybe some candle sconces on each side of mantel. 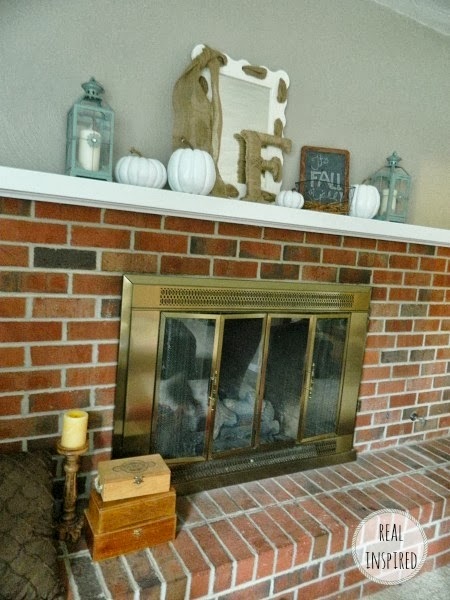 Your placement of your decorations is great, it does take time to get the balance, a lot of moving things around, putting other objects on the mantel. You could maybe elevate the pumpkins with the wood boxes you have on the hearth. Try different elevations that will help the eye to keep moving. You don't have to do all this at once. Just let your eye tell what feels right as you go along. That's half the fun of it. Love It! I have almost the same mantel. I added corbels to the bottom to sort of add a little something. You could maybe do that. I love the natural decor you used! I'm following you now! Such a neat idea! I love the way corbels look!